When yarn storage ideas are at a minimum, you're likely to have a huge mess on your hands. If you love knitting or crocheting, you know all too well how yarn can multiply in your home seemingly overnight. What was once a neat corner of your craft room can become a tangled mess of colorful threads. These yarn storage solutions not only help you get organized, but they look really nice, too. You might even find that your collection of yarn becomes an inspiration to look at while crafting. Before you go out and buy a new piece of furniture for storing yarn, do an assessment of the pieces in your home. This crafter realized that she had a wine cabinet in her living room that was always empty. Instead of filling it with wine, she opted to move the piece to her craft room and fill it with yarn. If you have a lot of craft supplies, you know that every inch of storage space counts. Yarn can actually be stored directly on the wall by using a pegboard system. Install a pegboard, then use either 4" or 6" pegboard hooks to store your yarn. You might have to "cake" or wind your existing yarn to create a hole in the center. Yarn storage solutions come in all shapes and sizes. This crafter found an old crib and decided to use one of the bed rails to hold her collection of yarn. This works well when all your yarn is thick enough to stay in place. Otherwise, you may need to pin it in place. Yarn storage cabinets are expensive and not necessarily well constructed. Consider repurposing an old dining room hutch for yarn. An added bonus is that all the closed storage works well for more unsightly craft supplies. You might have a couple of different areas in your home where you store your yarn. If you're in the middle of a larger project, consider crafting a basket to keep all that yarn and your needles together. You can move this around with you as you work and keep track of your supplies. 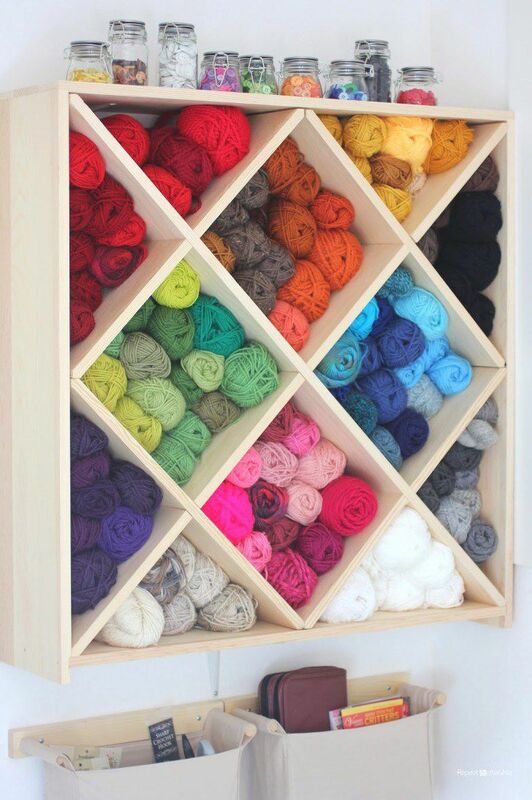 Cubbies work well as yarn storage cabinets​ because they allow you to organize by color. One way to make your cubbies more attractive and rustic is to use wooden crates for the shelving system. This gives you much more flexibility given the space you have available. If you have the resources available, consider crafting a custom built-in that will fit perfectly into your space. You might go this route if you are working with a steep ceiling. This will allow you to make the best use of space and adjust the dimensions accordingly. Instead of placing your yarn on a shelf, use wire baskets to keep the yarn together and organized. Wire baskets are a better option than baskets because you can see through them on all sides. When looking for options for yarn storage, first look at local home stores for discounted wine racks. Most wine racks will work well for yarn, and many can mount right to the wall. You might even consider building your own wine rack, then using that for yarn. If you have a lot of partial rolls of yarn, store them in glass jars that would normally be seen in a pantry. To make them more attractive, paint on chalkboard labels that you can use to identify color or type of yarn. Open shelving is a smart way to add storage space to a craft room. But how then do you keep those shelves organized? One creative way to build a robust wall organization system is to mount a variety of magazine holders on open shelving. If you want to make a cubby unit for your yarn for virtually nothing, you can recycle a handful of old coffee cans. Just be sure to clean them thoroughly before using them so all your craft projects don't smell like coffee. Emptying off an entire bookshelf will make sense if you have a ton of yarn to store. If you only have a couple dozen skeins of yarn, you might only need to clear off one shelf or a section of a shelf. In this case, you may be better off using a wire basket for storage. If you want to add a vintage look to your craft room, thrift a piece of furniture that would work well as a yarn storage cabinet. This old locker is as charming as it is functional. There are plenty of other vintage furniture pieces that would work well, too. Visit your local antique malls and get inspired. If you want your yarn storage to look inspiring, make sure to keep your bundles of yarn tidy and organized. One way to do this is to use cubbies that can be organized by color. Don't worry if you need to store more than one color or shade inside a cubby. If that's the case, keep warm tones together and keep cool tones together. Which Increase or Decrease Should I Use?